You will need to know all about the procurement management plan for the PMP Certification Exam. 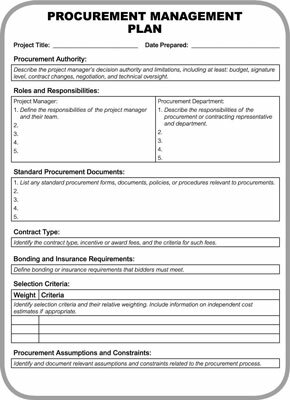 After deciding which elements to make and which to buy and selecting the contract type, you can document your procurement management plan, develop procurement documents and the SOW, and define your source selection criterion. A component of the overall project management plan, the procurement management plan describes how all facets of the procurement will be conducted. For small projects with simple purchases, a paragraph in the project management plan will suffice. For complex procurements, or when a project has numerous procurements or high-risk procurements, the plan should be more detailed and robust. The criteria that are essential to being able to perform the contract are screening criteria. If a proposal doesn’t demonstrate that the seller meets the criteria, then the seller is screened out of the process. Examples include needing specific licenses, having a minimum number of years of experience, or being financially sound. U.S. federal government contracts require that the source selection criteria be published. However, many commercial procurements do not publish the selection criteria. Establish the criteria you will evaluate proposals against. For this scenario, you decide on cost, references, and schedule. Rank the criteria in order of importance. You decide on schedule, cost, and then references. Establish a relative numeric weight for each criterion. Determine how you will objectively score proposals. You determine scores by comparing the information in the seller’s proposal against the Proposal Weighting Criteria. Multiply each vendor’s scores by its weight to get a rating, and then sum the ratings. Select the proposal with the highest total rating. The procurement statement of work (SOW) is a narrative description of the work to be done. It describes the deliverables in sufficient detail to allow sellers to determine whether they can complete the work, but it doesn’t define how the work must be done. The SOW can be very simple or very complex, depending on the needs of the project. Because it is the meat of the contract, it needs to be clear, concise, and not open to interpretation. The specifications, performance requirements, and support work will be defined and elaborated as part of the project scope definition. The quality requirements are defined as part of the Plan Quality Management process. Reporting requirements should mirror the reporting needs for the overall project. The procurement documents contain the SOW, instructions on how and when to respond, and any required contractual provisions.